The LTTE cadres were at their doorstep that night, to recruit one member from the family to fight against the on-going military thrust that was progressing rapidly towards Mullaitivu in 2008. They were eyeing to drag Devi Selvaraja’s (not her real name) elder sister’s husband, the sole breadwinner of the family, for combat training. Single and wanting to save the family with two young children, she had no option other than joining the LTTE. She travelled to Mullaitivu during the ceasefire to bring her sister’s family to Puttalam, where she was living with her parents. Unfortunately, with the LTTE’s sudden travel ban, she got stuck at her sister’s house in Kepapilavu, Mullaitivu. Devi, who was a garment factory worker in Puttalam, was given a brief combat training by the LTTE and sent to the battle fields. Ill-trained, forced to fight and injured after few months of fighting, she surrendered to the military during the final stages of the battle that ended in May 2009. “She has lost her right arm and all fingers of the left hand. Today, Devi lives alone in her small house in Kepapilavu, where she runs a poultry farm and maintains a small home garden. Sadly, people in her village, who also suffered in the war, have a different attitude over the women who had become differently able due to the war,” Head of Programs of ‘Viluthu’, an organisation that engages in empowering war affected women in the north and the east, Inthumathy Hariharathamotharan says. Inthumathy has interviewed nine war affected women with disabilities from the north and the east and Puttalam for the report – ‘Out of the shadows: War affected women with disabilities in Sri Lanka’, launched recently in Colombo. The report, prepared by the Law and Society Trust in collaboration with the Western Sydney University, is an outcome of a 12-month research process. Inthumathy says that nine women, including Devi, who were interviewed in the research, have said that they have been cornered by society due to their disability. “They lack recognition and respect. During the interviews they requested us to conduct some awareness programs for their villagers to change their attitude towards them. They are worried as they have become differently able not because of their own faults but due to the war, which they were dragged in,” she says. Viluthu, which supports and strengthens people’s network in the conflict-affected north and east, is working with female headed households and war affected women with disabilities. “But, women with disabilities never take part in our discussions and meetings. They are more concerned about livelihood support and getting recognition from the society rather than voicing their rights,” she adds. However, being interviewed for report after report, these war-affected women with disabilities, who have no faith in researches, are still hopeful that the authorities will do justice for them. Neglected and marginalised, their woes have fallen on deaf ears, so far. In this latest research report, they call for equality, dignity, recognition, support and also to include them when implementing state policies on Constitutional reforms, reconstruction and reconciliation. The report states that similar to the other women in the country, women with disabilities are also vulnerable to gender-related violence, abject poverty, stigmatisation and exclusion. The women in war-affected areas in the Northern and Eastern Provinces, in border-villages where the LTTE attacked during the early stages of the war, the Muslim women, who were chased away from the Northern and Eastern Provinces by the LTTE and now living in Puttalam district, women who are long-term internally displaced from the South and also from the Malayaha community have been interviewed in the final research. 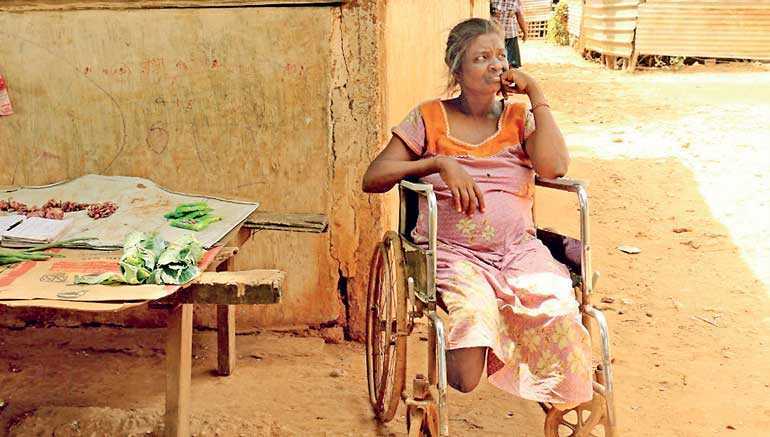 The report has cited the 2012 data of the Census and Statistic Department, which states that 8.7% of the Sri Lankan population has disabilities and 57% out of the total are women. They have disabilities in visibility, audibility, mobility, cognition, self-care and communication disabilities. Prevalence of visibility, audibility, mobility and cognition difficulties in women is significantly higher compared to men. The highest number of differently able women reports from Kandy, Trincomalee and Puttalam. However, the report claims that gender-based statistics of the Department do not provide any details on women disabilities. It further states that the international recognition for these women in the post-war scenario is minimal and the governmental recognition over them is inconsistent and inadequate. The National Policy on Reconciliation is an example of this gap as there is no recognition of disability as a critical factor that needs to be acknowledged and addressed in the reconciliation process, the report states. The research, which had used disability-inclusive research methodologies, has provided an in-depth account of their status within the post-war context. The final report, which has spelt out 21 findings and 11 recommendations, was assisted by Dinesha Samararatne, a lawyer and an academic of the Colombo University, Karen Soldatic, a research fellow of the Western Sydney University Australia and Binendri Perera, a lawyer and a researcher. According to the report findings, there is a need for public recognition and acknowledgement in all post-war efforts including law reforms, reconciliation or transitional justice to improve the quality of life of individuals and wider society. Highlighting the need of taking all forms of disabilities caused by the war into account when formulating post war policies for reconstruction and reconciliation, the report states that the disability caused due to the war, whether as a combatant, being shot at or being caught in a bomb blast, is problematic due to several reasons like one’s inability of getting adjusted to the sudden disability overnight, visibility of the physical disability such as embedded shrapnel and bullets or metal plates, clips that are inserted during surgery. The report also stresses the need of addressing the psychological trauma, disability, harm, loss to life and stigma associated with disability caused due to the war. “The severity of the trauma varies widely and is caused by a varied set of incidents. This includes the trauma of facing the war, such as when being displaced or fleeing hostilities. It includes the trauma due to damage to one’s own body – physically or mentally,” it explains. Stigma associated with disability due to cultural and religious practices is also one major concerns of the report. “In some communities, particularly in the north and the east, women with disability are not considered as being suitable for marriage, except perhaps for a man’s second marriage or to a man who is socially considered to be lacking in something – such as a man with a disability,” it states. According to the report, superstition considers women with disability as an ill omen to be avoided, particularly during significant celebrations of a family or a community and due to these negative perceptions, women with disability sometimes experience a sense of shame and rejection by their family and community. The majority of women who were interviewed in the research are suffering from trauma as they had witnessed the carnage in the last stages of the conflict. After a training on interviewing techniques, members of the Association of Women with Disabilities (AKASA) in Thalawa, Navajeevana in Tangalle, Women’s Development Centre (WDC) and Viluthu in Jaffna conducted the interviews with war affected women with disabilities. The report states that since there are no facilities to access to the legal system, the police stations, court houses and court proceedings are beyond their reach. Delays in law, prolonged detention of family members, disappearances of family members, land issues and domestic violence are the common legal problems among them, who have a very low knowledge on the existing laws in the country. They also lack awareness on human rights, transitional justice, constitutional reforms and also the initiatives taken by the Government on reconciliation. The implementation of the United Nations Convention on the Rights of Persons with Disabilities and the Convention on the Elimination of All forms of Discrimination against Women, including ongoing periodic review to identify gaps and issues in need of redress in relation to the interstice of gender and disability and adopting and designing mainstreaming strategies of disability inclusion across governmental departments and institutions to ensure that disability rights, accessibility and inclusion in national and local laws, policies, infrastructure development and programming are two main highlights among the set of recommendations presented in the report.